At the end of August, 2001, a disaster occurred. In the grand scheme of things, it was nothing compared to the national disaster that followed the next month, but it shook my world just as profoundly. In 1998 I had moved from NYC to New Orleans, and I had brought my freelance job with HarperAudio with me. It was a pretty good gig. I abridged books for audio release on cassette. Back in the day of cassette tapes, most titles had to be abridged to fit the tape length. In addition, I had almost immediately found a working relationship with a local glass artist doing architectural glass etching. These two revenue streams were my sole source of income. At the end of August, 2001, they both collapsed. My relationship with the glass artist foundered on poorly communicated expectations, and my editor at HarperAudio suddenly quit his job in a fit of pique, claiming he wasn’t appreciated by his co-workers. His replacement was less than thrilled about working with her predecessor’s stable of freelancers and let me know it. When the phone lines were finally clear after 9/11, I discovered my editor’s phone number was now connected to a fax line. My calls to the general number went unanswered. For two weeks I floundered, unable to grasp the enormity of suddenly having no income – and no unemployment benefits. When the towers fell, the landscape of the world changed. In New Orleans, tourism, a prime driver of the economy, vanished with the grounding of the airlines and took years to recover. I hadn’t held a conventional job in years, my resume was a patchwork of completely unrelated positions, and the New Orleans job market had evaporated. My salvation arrived in the guise of an invitation to Thanksgiving dinner. My parents live 1,000 miles away, my brother lives in Alaska, and we had stopped having regular celebrations years before, so I often found myself “homeless” for Thanksgiving. I embraced this invitation with pleasure, finally feeling that I had something to focus my energies on. I have always loved baking. As a child, I helped my mother make bread, and took over that job as a teenager. I delighted in trying new recipes and bringing my artistic inclinations to the process. I especially loved making challah, with its intricate braids. I mostly gave up bread baking in college, but continued to make cookies and quick breads for any party to which I was invited. My Christmas parties were the stuff of legend, with an almost overwhelming number and variety of cookies. For this Thanksgiving gathering, I decided to bring an apple pie. And therein lay my salvation. I have made many pies over the years, but I always like to try something new, to refine the process. This time, I used two kinds of apples—galas and fujis—and layered them in the pie shell. I seasoned them with traditional ingredients like cinnamon and sugar, and I piled them as high as I could possibly get them. As I like to do, I poured heavy cream into the center of the pie, through a hole cut in the top crust. I decorated the top of the pie with cutouts and pastry leaves. It was an epic pie, weighing over five pounds. At the afternoon feast, I had told the assembled company my employment woes – they were entirely sympathetic. There was a bit of brainstorming, but nothing really solid had come out of it. Then dessert was served. My pie was exclaimed over, admired, and devoured. And then my hostess turned to me and said “you should sell these.” The other guests chimed in, saying they would love to be able to order a pie from me for special occasions, and they were sure their friends would as well. I was dumbfounded and amazed. Could I really make a living making pies for people? I decided to give it a try. The assembled company thought $25 per pie was a reasonable price, and I got their orders then and there for five pies. They promised to spread the word. I went home and made up some flyers. With just this word-of-mouth start, I had as many orders as I could handle for the holiday season. It was a lot of hard work, but the satisfaction was worth it. Then Christmas was over, and demand for apple pies slowed considerably. I began to think of other baked goods I could make. During my time with the glass artist, Steve the Cake Man visited our little store-front shop several times a week. Steve was a cheerful, energetic man who came through the neighborhood carrying a large round metal tray bearing individually wrapped slices of cake. They were generously portioned and absolutely decadent—especially his red velvet and carrot cakes. At $2 or $3 per slice, they were also affordable and a welcome treat. Steve baked cakes every night and walked his beat during the day, covering a large area of New Orleans. Why couldn’t I do something like that? Cakes weren’t my specialty, and I wouldn’t want to compete with Steve anyway. What could I make that could be served by the slice? And I thought about banana bread. I had been perfecting my recipe for years (it’s deceptively simple), and everyone loved it—just sweet enough, with a little tang, rich and moist, with a creamy top crust. And then there was my almond poppy seed bread—rich and dense, almost like a pound cake, buttery and almond-y, with a crunchy sugar crust. I decided to bake banana bread and poppy seed bread. In my little kitchen at the back of my shotgun double apartment, I started baking. 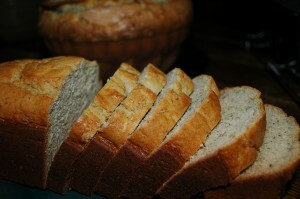 For my first foray, I made three loaves of banana bread and four of poppy seed. I sliced them about an inch thick, packaged them up in cling wrap, and designed labels with a list of ingredients. I created a logo and a name, From Scratch, and printed them out on colored paper. I attached a label to each piece with double sided tape, found a wicker market basket in my closet and lined it with a tea towel and loaded it up. OK, I was ready to go. That first day was a revelation. I started on Magazine Street, a seven mile long New Orleans’ street lined with areas of small shops and business districts alternating with residential. I went into galleries and gift shops, rug stores and antique shops, stores for clothing and furniture and jewelry. 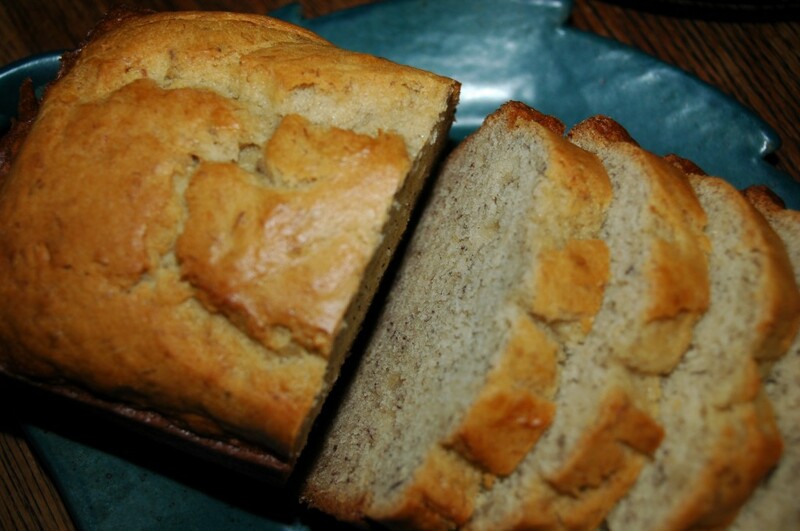 My pitch was simple – a gorgeous, perfectly fresh slice of banana bread or poppy seed cake for a buck. Some of the clerks and owners were cool to me, but the overwhelming majority was delighted to meet me and eager to try my wares. I had decided on a price of $1.00 per slice, thinking it was an amount people would find easy to spend on a little snack. This proved to be exactly right. At the end of the day, I was exhausted and my feet hurt, but my basket was empty and I had a wad of bills in my pocket. I went home and did some calculations. If I baked every other day and sold the following day, I could make it work. I was elated—here was something I could do that I loved, and that provided me with instant gratification. The looks on my customers’ faces when they tried my bread gave me a needed boost to the ego. As the weeks went on, I added shops in the French Quarter to my route, and then the vendors of the French Market. I discovered an added benefit to my new business: social contact. I became part of the life of the neighborhood – the shopkeepers and vendors looked forward to my visits. I have always been an initially shy person—I find it difficult to start talking to people I don’t know in most general social settings. I’m pretty good at making conversation with people who approach me, but it’s a real struggle for me to initiate contact. This new venture gave me an opportunity to talk with a wide variety of people with whom I would never have otherwise made contact. Even though I was terrified every time I went into a new place, I managed to overcome my fears and soon discovered that my customers opened up to me on a far more personal level than they would have if I had been a customer of theirs. I became part of the life of the neighborhood. Eventually, I had to gave up the Magazine Street route—it was simply too long and time consuming—and concentrated on New Orleans’ French Quarter. I developed a routine that took me along an established route to repeat customers and soon learned peoples’ favorites. A chance friendship with a man in my neighborhood who had bought an old chocolate factory to convert into a home provided me with several ten pound blocks of chocolate, and I began adding it to my banana bread, along with walnuts. It was a hit, and I started looking for other ways to use chocolate. Soon I began making chocolate candies: chocolate-covered pecan clusters, peanut-butter cups, crunchy peanut butter balls, molded chocolates with mint or orange flavors, and seasonal chocolates such as molded heart shapes for Valentines Day or chocolate-covered strawberries during Pontchatoula strawberry season. These were a huge hit, but became difficult to manage during the hot summer months, when it was a challenge to keep them from melting in the brutal heat. I kept most of my stock in a cooler in my car and made frequent trips back to it to refill my basket, but it was tricky none-the-less. I experimented with adding fruit to the basic poppy seed bread recipe, with mixed results, and started selling mint chocolate chip cookies as well. I labeled the ones with walnuts with a little male symbol, and the ones without with a female one. It never failed to amuse people once they figured it out. But it worked, and it kept the rent paid and the lights on. Eventually, however, the hours took their toll. I loved the baking, I loved the selling. What I didn’t love was the hours it took to package everything up. I tried a number of strategies, including replacing the plastic wrap with individual bags, but it was still time-consuming and mind-numbingly tedious. I couldn’t afford to hire an assistant without raising my prices and I didn’t want to do that. Many of my customers lived as close to the edge as I did, and they really appreciated being able to get something home-made for $1.00. An informal poll showed some resistance to paying any more, and I didn’t want to have to deal with making change. So it was that in February of 2003, right in the middle of Mardi Gras, I hung up my apron and started driving a taxi for United Cab, a gig that lasted until 2007. I have since, on occasion, baked up a few batches of bread or some cookies, packaged them up, and gone back on the street, but that part of my life is over and I can’t manage to go back to it. To this day, however, I still get stopped on the street by old customers wanting to know when I’m coming back. Oh – the banana bread recipe? 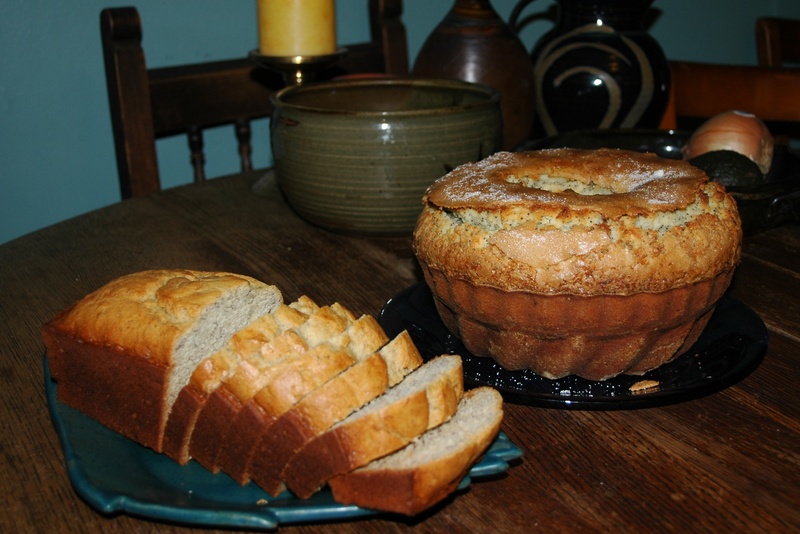 Well, here it is and may you get much joy from it and the Bonus Poppy Seed Bread recipe that follows. Cream together the butter and sugar, beating until light and fluffy. Gradually add the eggs, mixing thoroughly, then gradually add the mashed banana. Don’t worry if your nice, smooth mixture becomes watery and separated at this point, just mix well. Sift together all the dry ingredients, and gradually add them to the wet, stirring. Add the sour cream after all the flour has been incorporated, making sure to mix completely. If your batter is very thick, add a little milk. It should be thick enough to retain some shape when spooned on top of itself, but not so thick that it won’t (mostly) settle when tapped. This is the stage that takes a bit of tinkering to get just right. Tip: If you want to add ground walnuts or other ingredients, this is the time to do it; fold them in with a spoon or rubber spatula. I have found that mini chocolate chips work the best if you want to add chocolate, as they are light enough to not weigh the batter down and make it collapse. Grease three standard loaf pans and portion the batter between them. You want to leave about 1 inch to the top of the pan—don’t worry if it’s a little lower or higher, just don’t fill all the way to the top. Bake in a pre-heated 325° oven for 1 hour, or until a toothpick inserted in the center comes out mostly clean. Tip: The top will usually crack down the middle, stick the toothpick in there. If it comes out with just a few crumbs sticking to it, that’s perfect. The loaves will set during cooling, and the bread will be moist. It can take a few tries to get this exactly right. Set the pans on cooling racks. Let rest at least 15 minutes before slicing. You can leave the bread in the pan and remove slices as with a pie, or you can remove the bread from the pan and slice it on a cutting board. Tip: I like to use a chef’s knife rather than a bread knife – banana bread is more like a cake. When eaten right away, the top crust will have a lovely crispness. After a while, it softens and becomes creamy. Covered with either aluminum foil or plastic wrap,this bread keeps for several days at room temperature. Refrigerating makes the bread denser. 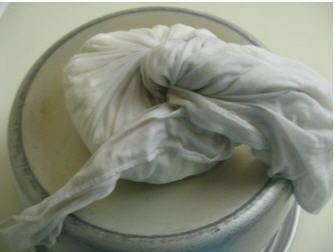 Tip: For loaves to give away, after completely cooling, wrap them in plastic wrap. Another option – you can bake loaves as gifts in disposable aluminum pans with snap-on plastic lids. Combine the wet ingredients in a bowl. Combine the dry ingredients in a larger bowl and make a well in them. Pour the wet mixture into the flour mixture and beat until smooth, making sure to scrape the sides and bottom of the bowl. Grease and flour 2 regular loaf pans, plus one or two mini loaf pans. The number of loaves varies depending on the size of your pans, so I always have several mini loaf pans on hand for any extra batter. Pour the batter in the pans, leaving at least 1” of room from the top. Do not overfill! Sprinkle the top of the batter with sugar, about 1T per loaf. Bake in a preheated 350° oven for 1 ½ hours, plus or minus 10 minutes. Mini loaves should be checked after 1 hr. Bread is done when a knife or toothpick inserted in the center comes out clean. Cool on racks. 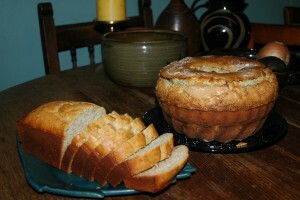 Tip: You can make this in a Bundt pan instead of bread pans, but make sure to grease and flour the pan thoroughly. Tip: Light colored pans work better than dark ones, which tend to make the bottom crust dry and overdone. Disposable foil pans work best of all. Nevenah Smith is a New Orleans artisan, art-fair roadie, writer and baker. You can find her unique art at www.nevenah.weebly.com or www.nevenah.etsy.com. Latkes are potato pancakes. They’re a traditional food amongst many people, including Ashkenazi Jews – that would be both my parents. They’re generally eaten around Hanukkah, where the oil they’re cooked in symbolizes a miracle that was supposed to have happened a long time ago in the Middle East during a period when people were fighting and killing one another. We could probably use a few miracles in that area today. In our household, latkes weren’t specifically a holiday food. They were just something my father would make whenever he had a mind to, which was pretty often, for example when his kids would hang on his arms and plead for latkes. They can be made as either an appetizer to a full meal, or – as a full breakfast meal in themselves with other breakfast-y things like ham, bacon, sausage and eggs. . . I first learned to cook from my father, which was pretty unusual back in those days. He was a businessman, but he loved eating! Trained as an organic chemist, he also loved figuring things out – things like recipes were second nature to him. I got older. Got married. Moved to Seattle. Kept cooking, couldn’t figure out *exactly* what it was that Pop did to make his latkes taste so damn’ good. Pop got older. Ultimately, after Mom passed away, he moved from Massachusetts to live with our family in Seattle, where he stayed for fourteen years. During this time, he made latkes for us on a regular basis, and I got to check out his chops with a more adult perspective. This is how he made them – and I found them perfect. Lacy, crisp, stunningly simple and painfully good. I suggest you follow this particular recipe fairly closely the first time you try it out, then you’ll have a better feel for exactly the proportions of onion and salt that will bring you maximum joy. This recipe will make enough latkes to fill 4-5 people up quite nicely, or 8 as a side dish with, say, ham and eggs. And – you’re right – we weren’t particularly observant Jews, certainly not where kosher dietary laws were concerned. Food was food in my folks’ book – and mine as well. Large bowl filled with cold water into which you’ve squeezed the juice of half a juicy lemon. Enough peanut oil (or vegetable oil or grapeseed oil) to fill your large 10″ ( or better, 12″) frypan about 1/2″ deep. A box grater. This is a critical piece of kitchen equipment. Do not use a food processor – you won’t get the same results. Preheat your oven to 350 and pop a cookie sheet with a wire rack into it. Put a couple of paper towels on the rack. They will not burn. This will hold your latkes in a warm, crisp state as you make ’em. Generally, whenever I make latkes, they seem to vanish – it’s like a magic trick – they disappear before I can get ’em to the oven. But you’ve gotta try, right?? Peel the potatoes and grate them on the coarse openings of a standard kitchen box grater. In time, you’ll learn to do this with minimal scarring. As the potatoes collect inside the grater, pop them out and into the bowl of cold water with lemon juice. This keeps them from browning and helps them crisp up a bit more. Use a white onion. 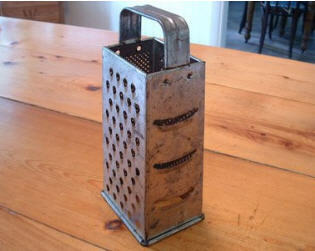 Grate it against the small holes of your box grater. This can take a little patience. You’ll end up with a kind of particulate mush. You want a solid half-cup of this particulate mush, which is in the range of about half a good sized white onion. Drain the shredded potatoes, then put them in a large clean kitchen cloth and squeeze the bejeezus out of them, twisting the cloth tightly to squeeze out as much liquid as possible. Or, you could use a salad spinner and finish drying ’em with paper towels. Put the mostly-dried potato shreds into a bowl, add the mushy particular onion bits, the salt, the two beaten eggs, the flour, and mix gently but thoroughly. Pour about 1/2″ oil into your large fry pan. . .let me digress: If you have one of those electric frypans – I have an old Farberware that used to belong to my Pop – they work better for any kind of quasi-deep frying because they’ll keep the hot oil or fat at a constant temperature without having to fiddle with the stove. Heat ’til it’s shimmering, but not close to smoking. If you take a spoonful of the potato mixture and plop it into the oil, it should begin sizzling nicely almost immediately. Cook this spoonful and eat it. People will crowd around asking for their latkes, but the chef always gets the tester. Take a large spoonful of the potato mixture and pour/scrape it into the oil. It will flatten out and form a circle. Approximately! You can make 3–4-5 of these at once depending on the size of your frypan, but do not crowd the latkes. Crowding the latkes just makes them irritable, and generates more steam than heat. 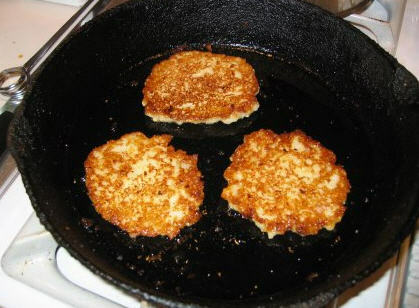 When the latkes begin to bubble on top, slide a spatula under them and gently turn them over, cooking for another minute or so until they’re browned lightly on both sides. Transfer batch of latkes to a plate with paper towels to absorb the oil, sprinkle with just a pinch of coarse salt (Kosher or coarse sea salt). Have one of your kitchen minions take the plate and gently move the latkes to the wire rack in the stove. In my experience, this is where the greatest inventory shrinkage occurs, so you may want to do this yourself, or just put them directly in the stove. When the oil’s come back up to temperature, repeat until you’ve used all your potato mixture. Weep that you did not make more. If you’re not using an electric fry pan, keep adjusting the heat so it stays approximately the same. Depending on the size of your pan and the heat source, you may need to turn it down a little or up a little. Serve immediately. Our daughter has discovered that you can put latkes wrapped in paper towels in an airtight plastic container and they’ll keep well enough to reheat in the stove for a day or two – but they’re really not the same. You’ve made your latke, you’ve salted your latke – now what do you put on top of your latke? This is a question that’s caused arguments for generations. It’s much like the question about borscht: sweet and sour or tomato, garlic and bay? I can only say let your conscience be your guide – I’ve included a number of traditional toppings, but me – I just like ’em straight out of the sizzling oil, with a little pinch of coarse salt. Ultimate Nom! After all, these are finger foods, and are definitely improved with condiments. I just happen to love the simple, pure taste of the primary ingredients. Many people who eat latkes as a traditional Hanukkah dish eat them for the eight nights of Hanukkah, so it’s clear a little variety might be in order! Bring on the condiments! A nice apple or pear compote. A little ginger is excellent in either of these. Compote is grown-up applesauce. Make a pear or apple / ginger compot by coarsely chopping up – wait for it – pear or apple, and adding it to a sauce pan with a tiny bit of water and a little sweetener. Then cook on low heat, stirring from time to time until all the bits soak up the liquid and soften up – usually 8-10 minutes. I have heard of people who put cranberry sauce on their latkes. It’s certainly a great nod to diversity – I’ve never personally tried it, but I would, it sounds like a great blend. Tart-sweet cranberries atop the succulent latke. . .
OK, so we were in a terrific rush. So Bonney’s tummy was feeling a little grumbly. So the streets had no signs on them, making it nigh-impossible to find any of the great restaurants that had been recommendd to us. Still – eating lunch at an Applebee’s restaurant in La Paz was a catastrophic mistake of the highest order. I decided a turkey club was harmless. How could you mess up a turkey club sandwich, right? Let me count the ways. First, the sandwich not only had turkey – foul dry slices from a processed chunk of long-dead meat. It had ham. At least, ham was my best guess for the 3/16″ thick slices of what I assumed was some kind of sandwich meat, glutinous and possibly made from a species of animal not of this Earth. Then, the bread was toasted until it was so crumbly I ended up having to use a knife and fork to eat a sandwich!! Even then, the toasted bread crumbled wretchedly around the meat, leaving me with a tiny bit of the squamous ham, the long-dead turkey, and, if I were lucky, a tiny bit of bacon. And by bit I mean – like – Bacon Bits. The cheese was a sharp mis-match – perhaps a smoked provolone. Again, it was difficult to tell it was cheese, let alone what kind of cheese it was. The lettuce was so old it had a picture of a man killing a tiger with a spear on it. And the tomato was. . .sorry, I can’t even talk about the tomato, it filled me with despair – and this in a land where perfect tomatoes were being grown at farms just a few kilometers out of the city. Binding everything together into a perfect package of putrefaction was about a quarter C. of lightly congealed mayo. I was famished, but could only eat two small bites before putting down my utensils. No mas. Surrounded by ethnic cuisine of the highest order, was this the best we could do? Tragically, the answer was “yes” – we were just in too much of a rush. The result? The worst sandwich I have ever eaten in my life. So, What’s the Contest and How do I Enter? Calorie Factory is soliciting stories for “Best Sandwich I’ve Ever had (or made)” OR “Worst Sandwich I’ve Ever Had (or made). The winners will have the pleasure of seeing their entry appear on Calorie Factory’s front page where thousands (OK, dozens, but we’re young!) of readers will get to read your tale. We love stories and recipes from our readers, so, send your story to jeffle@caloriefactory.com – we look forward to publishing it. Convinced by my artful weaving of celery leaves and sardines into a little deconstructed appetizer, Bonney agreed to give Pasta con Sardina whirl. I think it turned out pretty well, based on the fact that her serving vanished in mere moments, leaving behind only a vague fishy aroma in the air, a tiny speck of green on her plate, and the luscious aroma of metabolizing garlic. 8 oz. capelli d’angelo (angel’s hair ) or any long pasta shape of your choice. Note: Traditionally, this served with a large, sturdy shape, like perciatelle or pappardelle. I think it would also be good with bucantini. Half a medium onion, sliced. Pinch of coarse salt, fresh ground pepper to taste. One tin good quality sardines, packed in oil. I used King Oscar Two Layer in Olive Oil. I’ve been eating those forever, and I like ’em. Note: If you know of a better sardine, I would love to hear about it! Juice of half a juicy lemon + a tiny bit of finely minced zest. Two words: Microplane grater. Add the vermouth and water, deglaze the pan, scraping at the bottom with an enormous wooden spoon. Add the sardines. The operative word is gently. These little guys have had a rough life, you want to show them some love. Also, they look a lot nicer when they’re not mashed into tiny pieces. So gently, with reverence. I put them into the sauce and just tried to cover them up with a little of the sauce to their sides. You’re really just trying to warm them up, they need no cooking. Taste and correct for seasonings. You shouldn’t need much, if any, additional salt. Pasta on plate. Sauce on pasta. Careful!! The wee fishies are still very breakable. 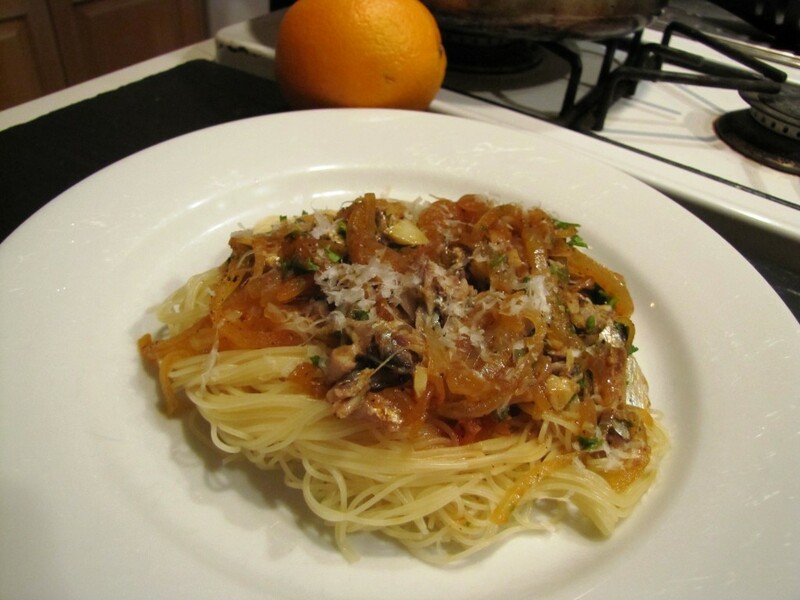 Serve with grated Pecorino. This went beautifully with a light salad. 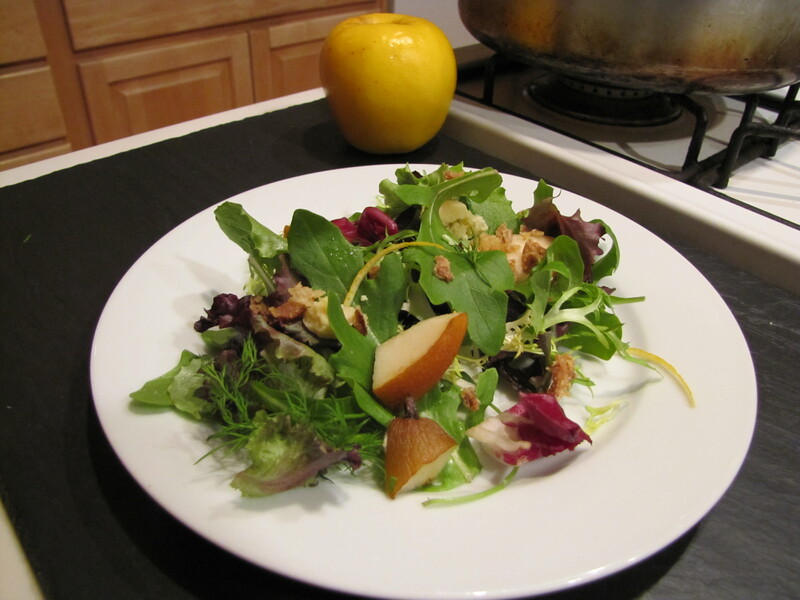 Bonney made a great salad with Trader Joe’s Salad / Herb mix (hey, it’s *winter* around here), some beautiful pieces of ripe Bosc pear, a few crumbs of Stilton cheese, and a few Lars Crispy Onions. Lars are (is?) the bomb! If you don’t have the time or inclination to crisp up your own onions or shallot, these little guys are beautiful, delicious, and made with only onions, vegetable oil, wheat flour and salt. Amelia at The Woodstock Farmers’ Market in Woodstock, Vermont, says she “worships these”. You can buy them at most good supermarkets. And you can even buy them at IKEA! Deconstruction is a word that’s used quite a lot in foodie circles. It was originally applied to literature by the French philosopher Jacques Derrida. He apparently also enjoyed cuisine, and you’ll see the term sprinkled liberally around in many blogs, Food Network shows and conversations. It is (an approach). . .which rigorously pursues the meaning of a text to the point of exposing the supposed contradictions and internal oppositions upon which it is founded – supposedly showing that those foundations are irreducibly complex, unstable, or impossible. It is an approach that may be deployed in philosophy, literary analysis, or other fields. Disassembling a classic dish – something which is generally recognized as an entity unto itself – to expose and combine its individual elements in an entirely different way, with different relationships – often in a playful spirit (at least as I see much deconstruction in the realm of food). A classic Sicilian dish is Pasta con Sardina – a wonderful dish based on sardines with lemon, pepper flakes, garlic, onion, herbs – often a little basil and / or oregano, and an appropriate pasta shape (click link to see a bit more about pasta shapes), often a pappardelle or perciatelle – a long noodle, robust and sturdy. Tonight, I was trying to convince Bonney that she’d love this dish. She was a little iffy on the sardines. 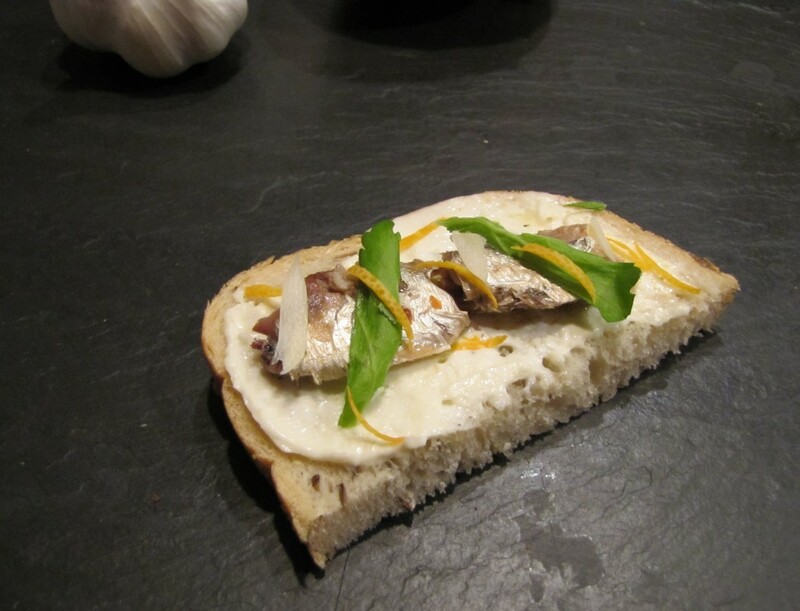 We don’t eat sardines much, and when we do, it’s usually when I fall prey to the unholy craving for a sardine sandwich with a little mayonnaise on rye with a bit of lettuce. Mea culpa – it’s sooooo good! Sprinkle of coarse salt on top – it just vanishes. I have no power over sardine sandwiches on rye. So, I said, “how about if I make you a deconstructed version of this dish as a kind of appetizer – a little bite – so you can get the sense of the sardine and some of the other ingredients”. Pasta con sardina is essentially a sautee of onion and garlic, sometimes a lil tomato paste, salt, pepper, lemon juice, and sardines, on a robust long pasta, with Parmesan cheese grated over the top. It often has a bread crumb topping, as well. The Deconstructed pasta con sardina appetizer I made is: A slice of rye bread, some extremely fine strands of fresh garlic, a little bit of a fine julienne of lemon, a torn celery leaf, teeny pinch coarse salt, teeny bit fresh ground pepper, about 6 hot red pepper flakes, and the smallest shreds of a good quality Pecorino cheese. I didn’t use the tomato, but I’m really not a strict deconstructionist. The Result? Instead Winner!! She loved it, and is now ready to eat the main pasta dish when I fix it in a bit. Deconstruction: It’s not only a rarefied literary theory and an often-misused foodie term – it can be your friend!! I’m as much a fan of heat as the next demented madman, but I have to say that Darth Naga and his very funny VLog, The Chili Foundry, take the enjoyment of peppers to a new height. Or depth. PG-13 warning, it is *not* pretty watching a grown man eating first a Naga Bhut and then a Naga Viper pepper all by themselves in swift succession on camera. Cheese Is Where the Heart Is – Mac and Cheese Forever! Macaroni and Cheese. Mac’n’Cheese. We ate it when we were little and we grew big. We ate it when we were sad and we grew happy. And big. Mac ‘n’ Cheese is as near to comfort food nirvana as it gets. 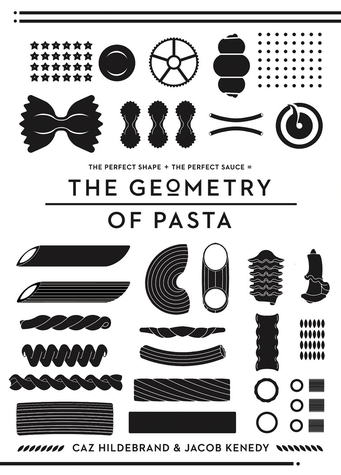 Pasta Shapes. Would you even think about using, say, spaghetti or fettucine for your Mac and Cheese? I doubt it. How about a little orrechiette (the ear-shaped pasta) or possibly some fusilli? Not likely! There’s a reason there are so many different pasta shapes. Sure, part of the reason is they’re just fun and if you were fooling around with a few hundred pounds of flour, water, salt and the occasional egg for hundreds of years, you’d be likely to come up with a few unusual shapes yourself. But the real reason there are so many pasta shapes – well, renowned British chef Jacob Kenedy notes in his excellent book “The Geometry of Pasta” that Pasta has evolved over many hundreds of years in Italy and it’s taken a long time for them to work out what tastes best. The right combo of pasta shape and sauce can be an exquisite experience. I *highly* recommend this book, not only for Kenedy’s (often-intricate) and unusual recipes, but for the simple purity that he brings to the notion of pasta with a saucing. Caz Hildebrand is a cookbook designer and his take – No Photos! – but rather beautiful, drawn-to-scale images of the different shapes, only adds savor and interest to Kenedy’s thoughtful descriptions and engaging recipes. Pasta morphology – who’d a thunk it was so important?? Historical American fave: The old standby, macaroni noodles. These are not, in my view, the optimal noodle, because they’re a little too small and tend to lie in the bed of cheesy wonderfulness and not soak too much up. But they work just fine. Editor’s choice: Penne rigate – this is my favorite shape. The medium-sized tubes are just the right size to each admit a dollop of cheese sauce, while the ridged edges tend to collect more sauce on their exterior. Those ridged edges also brown up beautifully on the top of the dish, lending visual (they’re brown! ), tactile (they crunch! ), and flavorful interest to the dish. About 1.5 pounds cheese. Trust me. Remember the Rule “it is not possible to use too much cheese”. In addition to using cheese for the sauce, you’ll definitely want to layer a good deal of it on the top before you bake. Extra-sharp Cheddar. I live in the Northwest, and use Tillamook Vintage White Extra Sharp 2-year old white cheddar. If you’re fortunate enough to live in a place where Vermont’s remarkable Cabot Cheddar is available at a reasonable price, by all means, use Cabot Extra Sharp! Parmesan, but be careful. Parmesan is a very strongly-flavored cheese that can overwhelm the gooey comfortableness you want. Used in small quantities, it can add to the savor. Jack cheese. A nice whole milk Jack, combined with an Extra Sharp cheddar, will give a silky mellowness to your Mac and Cheese sauce. Two tablespoons Dijon mustard. I used. . .Grey Poupon, but use any dijon you like. Feeling daring – use Coleman’s Mustard powder – about 3/4 teaspoon. Mix it with a little milk until it dissolves before adding it in. Definitely sharper and more assertive – some folks swear by it. Couple of pinches nutmeg. If you want to be formal, call it 1/8th teaspoon. Nutmeg is a potent flavor – you don’t really want to *taste* it so much as have it support the other ingredients. 2-3 Tablespoons vermouth or to taste (think cheese fondue!). Handy tip: 4 Tablespoons is 1/4 cup. I used 1/4 cup – I like the herbal flavor that vermouth adds. 1 teaspoon smoked paprika or 1 tablespoon mild Hatch chili powder. I tried the Hatch in this recipe the other night and it turned out beautifully. 1/2 cup or so Panko, a light flaky type of bread crumb that originated in Japan. Optional: a few dashes of Tabasco to taste. Jury’s out on this. I like hot food as much (or more) than the next person, but it’s hard to justify in a sweetly elegant Mac and Cheese. Preheat oven to 375, with the rack one up from the bottom level. Take the tablespoon of butter and butter your baking dish. I soften the butter in a microwave right in the baking dish, then smoosh it around the bottom and sides with my hand. Your hand is often the best tool. Preheat the milk until it’s barely simmering (do not boil the milk!) in a separate saucepan. Grate all the cheese on the coarse side of a box grater on a large cutting board or into a good sized bowl. If using more than one cheese (which I recommend! 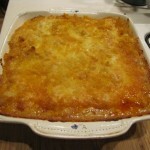 ), mix the different bits of grated cheese together with your hands. Put on a large pot of water to boil with two tablespoons of salt. Heat a good sized frying pan over medium heat, cut the 1/2 stick of butter into 2 or 3 pieces and add to the pan. Swirl and/or stir the butter in the pan until it’s stopped foaming. Add the shallot and cook, stirring frequently, for about 5 minutes, until soft and translucent. Add the garlic and cook for another minute or two until it’s fragrant. Cook with your nose. Add the mild Hatch chili (or smoked paprika) and stir it in thoroughly, stirring, for another 30 seconds or so. Lower the heat a bit under the pan and add the cornstarch (about 1/4 Cup). Stir it lightly and quickly. The idea is to incorporate the cornstarch into the butter mixture. Once it’s incorporated, and there are no dry bits, keep stirring and moving it around for a few minutes until the “starchy” flavor is gone. Try to avoid having it turn brown by lowering the heat under the pan as necessary and stirring frequently. Now you’ve got a roux! Slowly whisk in the preheated milk. Keep whisking. There will be little bits of roux here and there. Perhaps even big bits. Keep whisking. If you’ve got the wrist for it, you can do this with a good sized dinner fork. The bits will go away. You can turn the heat up just a bit. Keep whisking. Soon the mixture will begin to thicken nicely. At this point, add the mustard, nutmeg and about 2/3rds of the grated cheese (one pound), stirring well to incorporate and mix. Continue heating, stirring consistently, until the mixture is simmering and thick. Keep at a simmer for a few minutes, stirring occasionally, and put the pasta in the boiling salted water. While the pasta is cooking, stir the cheesy roux and taste it. Add salt and pepper to taste. I used about a teaspoon of salt and 5-6 twists of freshly ground black pepper. Keep tasting it. Cook the pasta until it’s not quite al dente. The pasta will continue to cook in the baking pan, will absorb more of the flavor, and have better texture if it’s not completely cooked before you pop it in the oven. Drain pasta, add pasta to buttered baking dish. Using a spatula or wooden spoon, pour and scrape all the cheese sauce from the sauce pan over the pasta in the baking dish. Gently stir to incorporate, making sure every piece of pasta is lovingly bathed in the sauce. Use the back of a spoon or fork to flatten out the surface neatly. Evenly sprinkle the remaining shredded cheese atop the mixture. Evenly sprinkle the Panko bread crumbs atop that. Some people say to dot the top with little bits of additional butter. 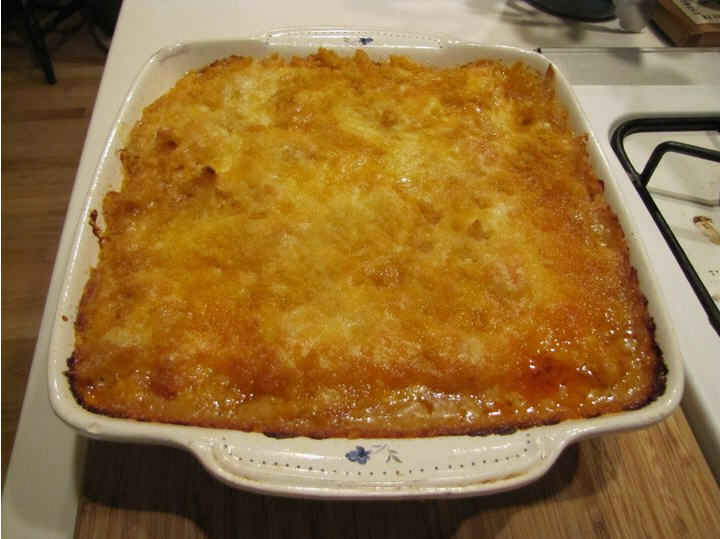 Go ahead if you like – I don’t – the panko absorbs a lot of oil and butter from the cheese and sauce. Pop it into the oven. Set your timer for 30 minutes. Ovens vary wildly, so at around 20 minutes or so, start checking. You’re looking for the dish to be bubbling a bit and the top to have a nice brown color. Once it looks something like the picture, turn off the oven and remove the dish. Put the dish on top of a cutting board or stove. Let it rest for about 6-8 minutes. This gives the molten materials time to settle back and makes it much easier to serve. To serve: Run your spatula around the side of the pan to loosen any sticking bits. Cut into serving size chunks – again, use the edge of your spatula. Get the spatula nicely under the chunk, move the plate close and pop it on the plate. CalorieFactory recommends: OK, sure, this is a pretty rich dish. But you can provide counterpoint by serving it with a side of lemon spinach. The short story (for four servings): About 12 oz. baby spinach leaves, 1/4 tsp. coarse salt (e.g. Kosher), Juice of half a lemon, pinch of brown sugar. Put the spinach in a glass bowl with a glass lid (or put a plate over the glass bowl). Add lemon juice, salt and sugar. Hold the lid – or the plate – firmly on the bowl and agitate around to coat the spinach leaves with the juice and seasoning. Put it in the microwave for about 2 minutes, covered. Remove. Take a look, it should be cooked down to a small fraction of its original volume. If it is – great! Using a slotted spoon, serve it up. If not, give it another 20-30 seconds. The spinach and lemon form a wonderful counterpoint to the Mac and Cheese. Taken together, these dishes offer Extreme Comfort and are endorsed by the American Society of Cardiologists.